The puddle reflects the landscape, the sky, the light and a window that fluctuates with its environs. It offers a mode of perspective in which an upside down viewer stares back. 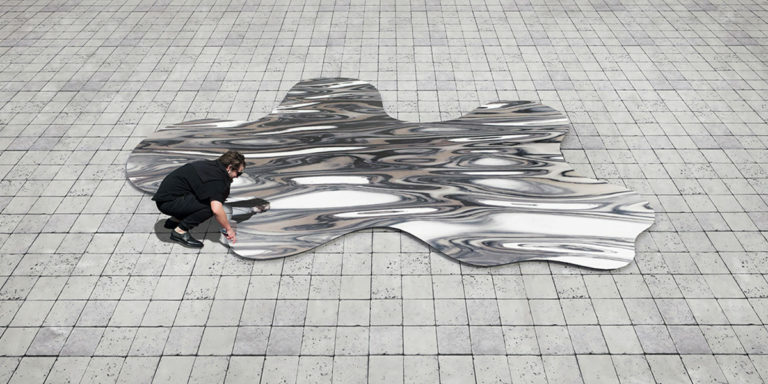 The viewer comes to realise the “non-existing” qualities of the puddle because it reflects something “existing” in the surroundings. The puddle is a sculpture by itself through negating itself, and in its place new interactions between human, environs and art appear. The Artist is an architect from Japan. Having worked in various design offices in Japan and abroad, and amassed experiences in interior design, architecture and urban design, he established the design firm CIRCLE in 2016. He believes that differences of cultures and environments create rich interesting opportunities to approach design, and through the act of creative design they can create a new society and lifestyles.